A must-have item for the gym, the dorm, or hotels is a great pair of slippers or flip flops that will protect you against whatever fungus and bacteria may be lurking on the shower floor. A good shower shoe is portable and easy to pack, is slip resistant, and has a comfortable fit. If the last thing you ever want to do is touch is a wet floor in public with your bare feet, we have the list for you! We have rounded up the best men’s shower shoes available to keep your feet clean, healthy and fungus free. An athletic slide that works great as a shower shoe is the Under Armour Men’s Locker III Slide Cross-Trainer Shoe. It can be somewhat hard to find an athletic slide that doesn’t have a microfiber or fabric under the strap, but this UA style is designed for the locker room, so they made it all rubber which means it will dry quickly. It also has drain holes throughout the sole that moves the water away from the foot. It isn’t the most comfortable sandal for some men due to the design of the footbed. But it is reliable, has good grip (so it is slip resistant), and it is reasonably priced. A good brand to look at the specializes in shower shoes is Showaflops. They have a great selection of slides and flip flops that will protect your feet from germs. They have the drainage holes, antimicrobial layers and slip resistant soles. Showaflops have a lot of fun colorful designs to choose from, and their flip flop styles seem to be a standard option for the dorm or summer camps. The men’s slides come in some reasonably attractive colors, and Velcro strap means that they can be adjusted to fit wide feet. The Vertico Sandal is another style that is designed specifically for the shower. They are fully waterproof since they are all rubber, they are also lightweight and safe for wet floors due to the excellent grip on the sole. The Vertico is also comfortable and durable enough to hold up well to daily use. They don’t absorb water and will dry out quickly. It is one of the few options with a very rigid footbed that has pretty good arch support. They don’t have any drainage holes, but it is designed in a way that doesn’t let water pool around your feet. The Vertico is probably one of the best options for tread and grip when you are around a wet floor, and also your foot won’t slide around within the shoe. The sizing appears to be a little challenging to get right with this design, as they fit a little small. Adidas has two slides that work well for the shower. They are Adidas Adissage Slides and Adidas Originals Adilette Slides. The Adissage can be kind of uncomfortable because they have little massaging numbs on the footbed that takes a bit of getting used to; some people love them some hate them. The nubs have the added benefit of keeping your feet elevated from the water pooling on the footbed. Apart from the nubs, what makes them great as a shower shoe is that they dry pretty quickly. They also have a Velcro adjustment, so you can adjust them to get a good fit. The other great thing about the Adidas slide is that they are very durable and should hold up well to being used daily. You can also try the Adidas Originals Adilette Slides if you aren’t sure you would like the nubs on the Adissage. They are mostly rubber with a small amount of fabric under the strap, but it seems to be able to dry quickly. They aren’t the most cushioned slide, but they are a durable option with good non-slip features. The Crocs™ Crocband™ Flip is a lightweight, very comfortable flip flop that works great as a shower shoe. It is all rubber so is it able to dry quickly, you can clean it easily, and they have good traction on the sole. They are also very durable and come in a rainbow of colors, so you aren’t stuck with just black like most other shower shoe options. The Crocs also have antimicrobial properties, so it gives you a little bit more protection from the mildew that may grow on the shoe if you are putting it into your gym bag before it is completely dry. Nike have a number of slides that men use as a shower shoe, in particular the Benassi seems to be used quite a lot for the locker room showers. The Benassi has a bit of microfiber under the strap, so it isn’t necessarily the best option unless you can let it dry out before storing it. Nike does have a shoe that is designed especially for the shower called Nike Kawa Shower Slide, it is nowhere near as popular as other Nike slides and tends to get mixed reviews as it seems to fit a little small on most men. Anyway, it does have drainage holes and is comfortable; just the sizing seems to be off – leading to the bad reviews. The KAWA Shower Slide are all rubber, so they don’t have any issues drying quickly after in use. If you are interested in this shoe there are Nike 2 sandals with the name KAWA, so don’t get these confused with the regular KAWA slide. Some men just like a basic flip flop to wear in the shower. 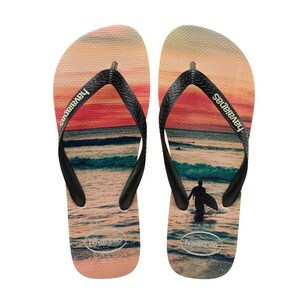 Flips flops are usually inexpensive, come in nice designs and dry out quickly and easily. My only concern with some flip flops is that the tread on the bottom may be too slippery, making them dangerous to wear on wet floors. If you think flip flops are the best option for you, some nicely designed styles with a little bit of grip on the soles are from Havaianas. Anti-slip tread– First and foremost look for a design that has an anti-slip tread which will give you a firm grip on the sole. It is not hard to slip in a locker room if you are wearing the wrong kind of flip flop with no tread on the bottom. Drainage holes-The best shower sandals have small holes on the footbed that allow water to dry drain out and not pool on the near your foot. If water starts to pool around the foot is pretty uncomfortable and can get slippery. Antimicrobial Properties– For a little bit of extra protection against germs and fungus it is well worth looking for designs that have antimicrobial properties. Not only will it protect your feet from the germs and odor, but it will protect the shoes themselves from bacteria, fungus and mold developing on the footwear. Mobility issues: If you need a design that has straps to keep your feet secure due to mobility or other issues, those are a little harder to come by, since most styles are either slides or flip flops. You could try a brand like Teva or Keen that has sports sandals with straps that are waterproof so they are easy to dry, they also usually have anti-odor anti-bacterial features to them. Unfortunately, the price for those types of sandals is going to be a lot higher than products in this post. Athletic slides– Athletic slides are a lot of men’s go-to for shower slippers, but not all styles are good options to get wet. Many of the designs have padded microfiber on the inside of the strap, so it stays wet all day if you just put it into your gym bag. It leads to mold problems and shortens the life of the shoe. If you are looking for an athletic slide for the locker room, make sure it is all rubber. Cleaning– If you don’t clean your shower shoes regularly, mold and fungus can grow on it. I think a lot of people think that because the footwear is worn around water, the water must be cleaning the shoe. Not necessarily the case. You need to remember that the bottom of the shoe will be picking up what is on the shower floor, so make sure it is cleaned off regularly. The other issue with cleaning is that if you are using the shoes then putting them in a bag when they are even a little bit wet; you will probably see some mold issues because of the dampness. Not only should you dry out the shoe, but ensure the storage area is also kept clean and try. When using a shared shower, getting a pair of flip flops or slides to protect yourself against foot fungus (and other microorganisms) that thrive in warm, wet environments is a simple and effective way to avoid having to deal with athlete’s foot.